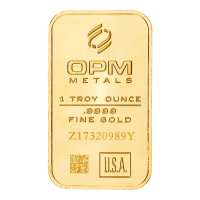 Buy 1 oz Ohio Precious Metals Gold Wafer Bars | ?? 1盎司俄亥俄贵金属金箔条 It is possible to verify the authenticity of each bar with OPM by scanning the QR code with a smart phone. This links to the OPM website confirming the manufacture date and authenticity of the bar. No two bars have the same serial number / QR code. Each bar is made of recycled gold and has been certified by SCS, a trusted leader in third-party environmental, sustainability and food quality certification, auditing, testing and standards development.